Those who go above and beyond when caring for some of the frailest people in the community were recognised at the recent annual Aged & Community Services Australia Victoria (ACSA Vic) gala night. A key component of the VEP philosophy is choice, and this saw the organisation introduce changes to the way it provides food services. Since a buffet style breakfast was introduced into its Dandenong aged care home, staff noticed residents who had previously stayed in their own room to eat breakfast were joining others in the dining room. “The award is a great achievement and recognition of the wonderful work staff hand volunteers have done over the past year to support and assist older people to live the best opportunities,” says Mr Newton. In the Employee category, joint winners were Bill Brennan and John Curtis from the Royal District Nursing Service (RDNS). Both are part of the RDNS Homeless Persons Program and over the last 13 and 16 years respectively, they have provided a cohesive primary health response to Supported Residential Services in the Inner South Region of Melbourne. Mr Brennan and Mr Curtis demonstrate a service commitment on a daily basis to a group of people who are often ignored, viewed as difficult and non-compliant. In articulating what they like about their jobs it always comes back to the people they work with and a belief that their interventions do make a positive difference. 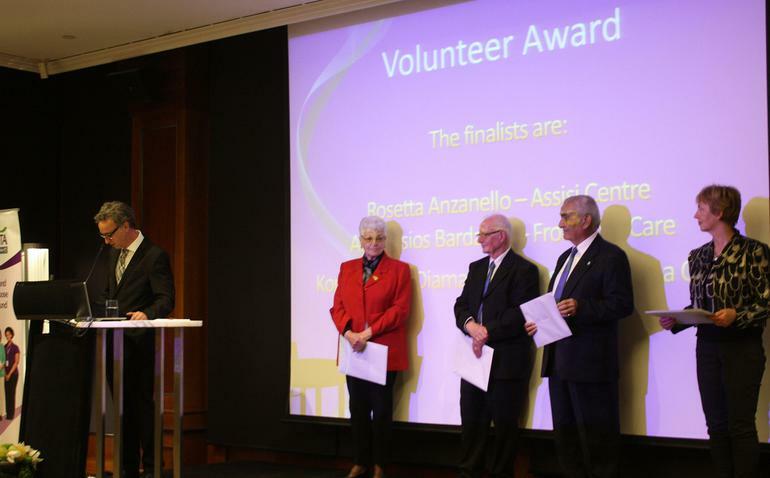 Recognised for his 17 years volunteering with Fronditha Care, Anastasios Bardakos was presented the Volunteer award. As well as knowing all 120 residents in the Thornbury facility personally, he initiated, organised and also regularly participates in the ‘Kafenio’ activity - a Greek tradition where men gather in a café and play backgammon, cards, read the newspaper and discuss politics, while drinking some wine and eating meze.